Peterborough boosted their League One play-off chances with victory over struggling Colchester. Posh, on a high after winning the Johnstone's Paint Trophy victory on Sunday, were in front when Tommy Rowe headed in Grant McCann's corner. The U's rarely threatened, with Freddie Sears's blocked shot their best effort. Danny Swanson should have doubled the lead but poked wide, before Britt Assombalonga raced clear for his 29th goal of the season. Posh boss Darren Ferguson wanted Sunday's 3-1 win over Chesterfield at Wembley to be the catalyst for his side's push for promotion back to the Championship a year after relegation. This victory puts them four points clear of the chasing pack for the final play-off berth, with a game in hand over the teams below. Peterborough started confidently against a side with just one win in their previous six outings, with Tosin Olufemi clearing Shaun Brisley's effort off the line and McCann curling an effort on to the the post. Posh finally took the lead when Rowe rose to head in McCann's corner midway through the first half. And the U's, unable to register a shot on target all night, contributed to their own downfall when Assombalonga charged down a Magnus Okuonghae clearance and sprinted into the area to fizz a low shot past Sam Walker. Colchester, who remain three points above the relegation zone, opened up more in the final 20 minutes, but Posh still made the better chances and McCann, Jack Payne and Assombalonga all went close to improving the scoreline. Match ends, Peterborough United 2, Colchester United 0. Second Half ends, Peterborough United 2, Colchester United 0. Attempt saved. Kyle Vassell (Peterborough United) header from very close range is saved in the centre of the goal. Attempt saved. Nicky Ajose (Peterborough United) left footed shot from the left side of the box is saved in the bottom right corner. Alex Gilbey (Colchester United) wins a free kick on the right wing. Substitution, Peterborough United. Kyle Vassell replaces Danny Swanson. Attempt missed. 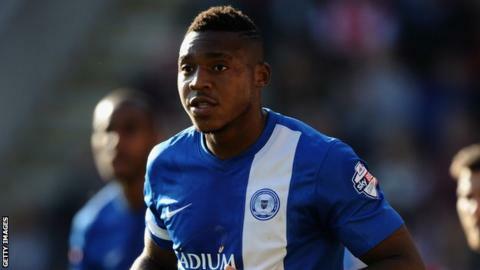 Britt Assombalonga (Peterborough United) left footed shot from the left side of the box misses to the right. Attempt missed. Jack Payne (Peterborough United) left footed shot from outside the box is close, but misses to the right. Mark Little (Peterborough United) wins a free kick on the left wing. Drey Wright (Colchester United) wins a free kick on the right wing. Substitution, Peterborough United. Nicky Ajose replaces Conor Washington. Attempt missed. Conor Washington (Peterborough United) right footed shot from the centre of the box misses to the left. Corner, Colchester United. Conceded by Sean Brisley. Attempt missed. Grant McCann (Peterborough United) left footed shot from outside the box is too high. Hand ball by Tom Eastman (Colchester United). Attempt saved. Britt Assombalonga (Peterborough United) header from the left side of the six yard box is saved in the centre of the goal. Corner, Peterborough United. Conceded by Tosin Olufemi. Substitution, Peterborough United. Lloyd Isgrove replaces Josh McQuoid. Attempt missed. Danny Swanson (Peterborough United) left footed shot from the right side of the box is too high. Corner, Peterborough United. Conceded by Magnus Okuonghae. Substitution, Colchester United. Drey Wright replaces David Wright. Substitution, Colchester United. Jabo Ibehre replaces Clinton Morrison. Goal! Peterborough United 2, Colchester United 0. Britt Assombalonga (Peterborough United) right footed shot from the right side of the box to the bottom left corner. Jack Payne (Peterborough United) wins a free kick in the defensive half. Substitution, Colchester United. Gavin Massey replaces Dominic Vose. Mark Little (Peterborough United) is shown the yellow card. Foul by Mark Little (Peterborough United). Ryan Dickson (Colchester United) wins a free kick in the attacking half. Attempt missed. David Wright (Colchester United) right footed shot from outside the box is just a bit too high. Tosin Olufemi (Colchester United) is shown the yellow card. Josh McQuoid (Peterborough United) wins a free kick in the defensive half. Foul by Tosin Olufemi (Colchester United). Attempt missed. Danny Swanson (Peterborough United) right footed shot from the right side of the box misses to the left.